Phoenix Half, 1:16:06 (1:16:07 on my watch), 23rd overall, 3rd master, $50. Ben Bruce won with 1:04:33, then Mike Hardy 1:05:07, Riley Cook 1:05:11 - breakthrough races for both of them. Unfortunately I got double-chicked - Belainesh Gebre won the women's with 1:15:12, and Janet Bawcom ran 1:15:25. They both pulled away from me in the first mile. I did not try to go with them as I was not certain of my fitness. This was a good decision I think as I felt my pacing was just right. This is the second time in my running career that I got chicked and won money. I suppose old age comes with some benefits. Benjamin struggled today but ran an OK time of 1:10:51 finishing 9th. The conditions were ideal. Both Benjamin and I had a lot of trouble sleeping the night before. Somehow, though, I was able to have a good race, but he felt the fatigue. I would have expected it to be the other way around given that he is 18 and I am 43. I was happy with his first 3 miles (5:10, 5:14, 5:17) and last 2.109 - 11:06 which is 5:15 pace. He felt cardio struggle after 3 miles, then he decided to take Gatorade around 6, this gave him stomach distress forcing him to slow down to 5:40, but this gave his heart a break and he was able to speed up to 5:15 over the last 2 miles. My performance literally came out of a hat. A month ago I struggled through an 18:07 5 K - maybe adjusting for the weather we could call it 17:47, adjusting for the altitude maybe 17:27. Today I averaged 18:02 5 K pace through the half, the closing 5 K was 18:05, and there was one in the middle in about 17:39. I suppose the difference came from long tempo runs and other speed sessions - my mileage has stayed the same. I also did not feel the caving of the legs as the race progressed like I did in the Monumental Half in November, and when I finished they were in pretty good shape. I think the difference came from including fast running uphill over fairly long stretches - 2-2.5 miles in the workouts. Another possible contributor is cross-country skiing - I did it only twice before the race, but one thing I am considering as a possibility is that an hour long session resets my muscle activation patterns, and then when running I strengthen different muscles. Took the initiative to catch up to and latch on to a runner that I could not identify. My mystery runner sped up, I felt good enough to follow, Brett (eventual master's winner) right behind me. This is getting too fast but if I back off I'll be left alone and I do not run well alone. 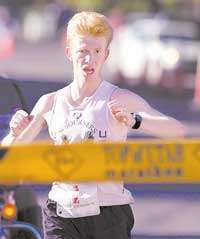 I saw a runner (Matt Limbert) in front that was coming to us, and figured he was going just the right pace for me. So I caught a ride to Matt. Got right behind Matt, Brett and the other runner kept moving. Somehow both of us lost focus here. Time to make up. Brian Valentini passed us. I think if Matt tried to latch on, I would have gone, but I felt that trying to go with Brian would be a mistake possibly leaving me alone for half a mile after a mile. Matt is speeding up, but I am able to respond. I stayed with Matt all the way up to about 100 meters to go, and then I just did not have the speed. Cool-down + errands + airport running, some with Benjamin. Good work Sasha and congrats on 3rd master. Solid performances from you and Ben as usual. Nice race Sasha; it was good seeing you guys down there. It was a strong showing from the Utah contingent.